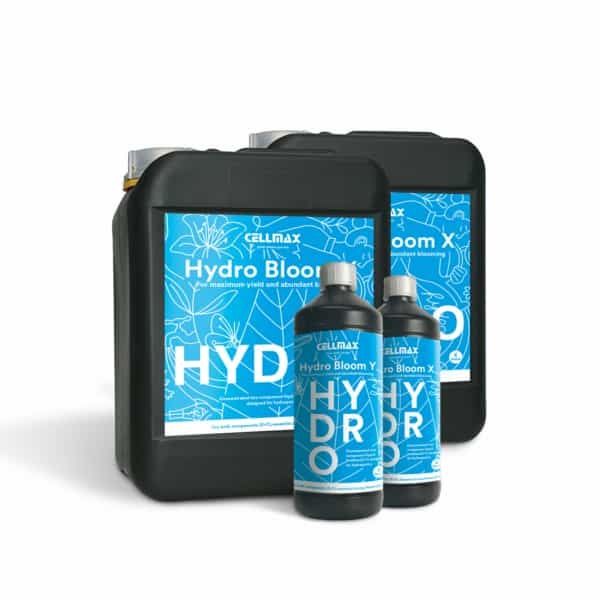 Cellmax Hydro Bloom is a concentrated two component liquid fertilizer designed for Hydroponics. Cellmax Hydro bloom is a specially developed nutrient which adjusts the EC-level of the tap water to use with hydroponics. With Hydro Bloom the plant always receives the optimum proportions of nutrients to make your plants strong and stimulates the fruit development. Hydro Bloom is a two part mixture (X and Y) for the Bloom phase and contains all the trace elements necessary for exceptional results. Cellmax Hydro Bloom is suitable for all the common hydroponic systems like: NFT,Run-to-waste systems, dutch buckets, deep water culture and Aeroponics. Tap water contains a lot of useful elements such as calcium, magnesium, sulphate, Phosphate and bicarbonate. Hydrobloom is a specially developed to benefit from these elments in tap water and adjusts the EC-level of the water for use with hydroponics. With Hydrobloom, the plant always receives the optimum proportion of nutrients, and preventins a build up of redundant salts which are damaging to both the plant and the environment. Hydrobloom is a two part mixture (X and Y) for flowering stage and contains all the trace elements necessary for exceptional results. Warnings: never mix the X and Y components together undiluted, this will result in insoluble mixtures. The concentrated nutrient contains salts and acid which may irritate skin, eyes. Lips and throat.